How long have you lived there? Since I started college fourteen years ago. Are you married? Unfortunately, no. Full time job? Yes, I work for an employment agency as direct support staff. Education? I graduated from Oakland-Craig Public High School and Midland Lutheran College (now Midland University), where I earned a bachelors degree in Art with a concentration in Commercial Art. Who is your favorite author and book? That’s a bit of a toss-up since I’ve read so many books over the years! I think that it’s between J.K. Rowling and the Harry Potter series (not sure which book), and Frank Peretti and the Veritas Project books (again, not sure which one). 9. What is your preferred genre? YA Fantasy, though I’m also really fond of Science Fiction (which is generally the genre I write in). 10. How did you start this journey to become a writer? I love imaginative stories. So much so, that when I can’t read or watch them I generally just start making them up in my head. I wrote some of them down when I was younger but they just ended up disappearing into old hard-drives and drawers. I didn’t do much creative writing in high-school or college. Then, just after college while I was working a menial labor job, I had a story form so completely in my head that I just started writing. A few months later I had the first draft of a novel. However, even after a lot of editing and a few drafts, it still had story flow issues and I couldn’t get it published. But I kept on writing, and eventually created “Experiment 93”, first as a newspaper serial and then as a novel. 11. What have you written so far? My only published work so far is “Experiment 93,” unless you count the short stories that I’ve put up on my often neglected blog and my Facebook page. 12. Tell us about your current book. 13. What is the inspiration for your current book? I’m fond of stories with a young protagonist going through everyday life hiding some incredible secret about themselves from a world that thinks they’re just some ordinary person. 14. Who was your favorite character to write and why? My favorite character to write was Cheryl. I love characters that undergo big transformations. (spoiler alert) Cheryl’s transformation from antagonist to protagonist is dramatic and dynamic, and she keeps a lot of that bad-girl attitude, which I really think makes for an interesting character. 15. Is there anything of you in that character? Not really. I mean, most of my characters picked up a bit of my smart-alec tendencies, Cheryl included, but aside from that and her artistic tendencies, we really couldn’t be much more different from each other. 16. What sets your book apart? The premise in and of itself is pretty unique as far as I am aware. The way that it blends humor, drama, action, and romance, while addressing deep philosophical and theological questions creates a very interesting and dynamic narrative. Also, while most science-fiction bases their space travel and gadgets off of QED physics, I decided to base them off of GED physics. I think that this really created some unique and pretty cool alien gadgets and weapons. Finally, the way that the story develops and is resolved in the end is also pretty unique, and I haven’t seen anything quite like it. 17. What’s your favorite part in the book? 18. What was the most difficult part to write? The blurb on the back. I hate doing those. Summarizing is not my strong suit. 19. What was your favorite book to write? 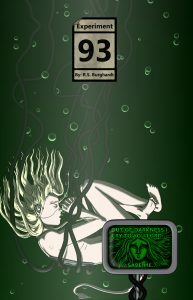 If we’re talking published books then, obviously, “Experiment 93” is the only choice, but if I can include the unpublished ones then I think that I enjoyed writing the first book that I ever wrote, “Liquefy”, the best. There was this extra bubbling of excitement the first time that I actually created a novel. My hands just couldn’t keep up with my mind. I kept a notebook with me to write down the story whenever I had a spare moment, and there were several times that the only reason that I stopped writing was that my hand was too cramped to keep hold of the pencil! 20. How do you write? Do you have a set time or place? How many hours a day? I try to write at the local library, because going somewhere else to write puts me in the right mind-set and helps me to concentrate on what I’m doing (plus, it means that I don’t have to contend with the cats’ attempts at doing a little of their own writing on the manuscript). However, if I don’t have the extra time to drive to the library then I’ll just plop down on the recliner or at the kitchen table. As for how long I write, I try for about an hour a day, every day except Sunday. I tried two hours a day, but I found it too hard to stick to. If I miss a day, I roll it over to the next day. Sometimes I can get pretty far behind, but I generally catch myself up. 21. Why did you want to be a writer? As I said before, I love imaginative stories. I read a lot, and since sometime back my own stories have just bubbled up from inside of me and I wanted to share them. I would, therefore, write even if only a single person would ever want to read it. However, because I enjoy doing it, I would really love to be able to do it for a living. So, I’m hoping that a lot more people decide that they want to read my work. 22. How do you get your ideas? Sometimes it starts with me liking a story or a concept for a story, and asking myself “How would a story like that look if I were to write it?” Sometimes it starts with me thinking to myself, “Wouldn’t it be cool if (add concept here)?” or “Wouldn’t it be interesting if (add concept here)?” Some of my stories have come from dreams, and sometimes they spawn from me turning over some theological or philosophical idea in my mind and trying to understand it, or make it understandable to others. However the idea comes to me, I generally let it percolate in the back of my mind for a while before I write it down, except in the case of dreams, where I’ll write an impression of it immediately to fix it in my mind before I start turning over the idea. 23. What do you have planned next? I’m already about 300 pages into another book in the same universe as “Experiment 93” called “Resonating Souls”. I still haven’t decided whether that will be the series name, the book name, or both. It’s about a man that gets pulled from our world to another in a nearby galaxy through the “paths” (supernatural portals in space-time that were introduced in “Experiment 93”), to be the partner of a path-maker (one who can create paths) in her missionary work for the Sanctuaries (the centers of Christianity on that world). Because of the Medieval/Renaissance sort of setting on the other world, coupled with the supernatural abilities of the sanctuary brothers and sisters and the mishmash of different intelligent species that have ended up on the world due to the path-makers, it ends up with a much more Fantasy-ish feel and at times it becomes a little bit steampunk. That’s all that I’m going to say about it now, but you can look forward to hearing more about it in a few more months. Hi there, You have performed an incredible job. I’ll certainly digg it and in my opinion recommend to my friends. I use WORDPRESS FROm a site called SITEGROUND.